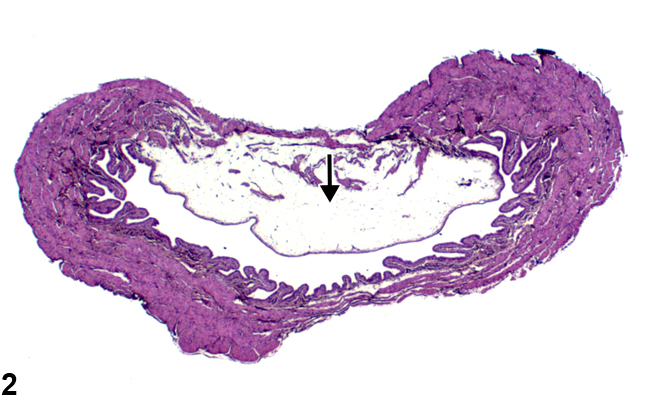 A focal area of edema in the urinary bladder submucosa from a female B6C3F1 mouse in a chronic study. 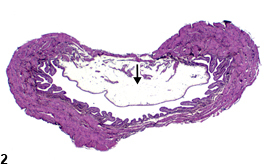 Artifactual edema-like change (arrow) from inflation of the bladder with fixative, from a female F344/N rat in a 14-day study. 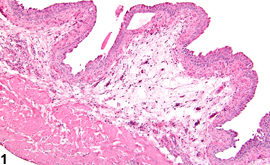 Edema is usually seen with other lesions, particularly inflammation, and is typically noted as an amorphous, slightly eosinophilic fluid in the subepithelial connective tissue ( Figure 1 ). Edema has to be differentiated from artifacts produced by inflation of the urinary bladder with fixative solutions ( Figure 2 ). Since some edema is seen with inflammatory and/or vascular lesions, edema should not be diagnosed unless it is a major component of the lesion. Hard GC, Alden CL, Bruner RH, Frith CH, Lewis RM, Owen RA, Krieg K, Durchfeld-Meyer B. 1999. Non-proliferative lesions of the kidney and lower urinary tract in rats. In: Guides for Toxicologic Pathology. STP/ARP/AFIP, Washington, DC, 1-32.